We’d love your help. Let us know what’s wrong with this preview of Send In The Waco Killers by Vin Suprynowicz. Your right to trial by a randomly selected jury -- not one stacked with jurors who swear to convict in advance -- is gone. The IRS can now seize your bank account, paycheck, and house -- without so much as a judge's order. Your banker will help them. Vietnam veterans and their wives, and 68-year-old engineers, are in federal prisons on "drug" charges -- despite the fact they never sold, touched, or even saw a single gram of cocaine or marijuana. The Founders guaranteed Americans the right to keep and bear arms for defense against their own government. But the meager legal arms of the Branch Davidians were no match for government tanks and helicopters at Waco. National gun registration led to confiscation in oncr-free England and Australia. And national gun registration began in the U.S. on December 1, 1998. How did we get to this point? Is there any peaceful way back from the toboggan ride to tyranny? The answers are in "Send in the Waco Killers," by America's syndicated Libertarian columnist, Vin Suprynowicz. 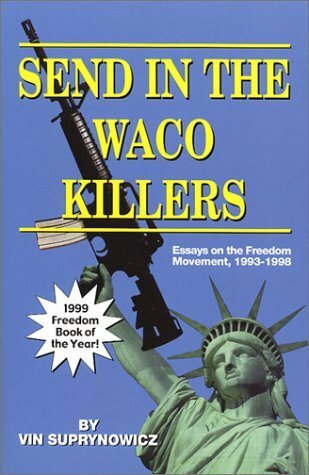 To ask other readers questions about Send In The Waco Killers, please sign up. in fact, americans were enormously more free under king george 220 years ago--before the revolution. well....we do have the incandescent light bulb. Caution.., reading this book is like drinking grain alcohol!